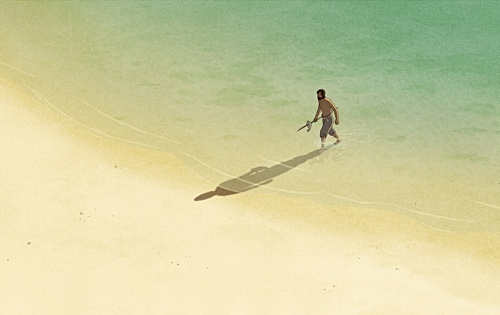 Perhaps the most beautiful element of “The Red Turtle,” directed by Michaël Dudok de Wit, is its lack of dialogue. Because there are no words, we rely on the images to formulate an interpretation and build upon it. Combined with our own cultural backgrounds and unique life experiences, I would interpret this film differently than, say, a person next to me, or someone else who lives on another continent. And yet the picture, miraculously, is universal because it tells the story of life itself. Sure, the premise involves a man who finds himself stuck on an island, but it proves to be so much more than a familiar template. This is a picture that will stand the test of time. The opening minutes is a gargantuan curiosity. We wonder about the identity of the nameless man—from his age, where he’s from, to the circumstances surrounding how he ended up on the island. Why is it that each time he builds a raft and attempts to sail it across the ocean, the giant red turtle smashes it to smithereens? Why doesn’t his strategy change after facing one failure after another? It is always the same raft, made of the same materials, using the same path to the water. Why does that particular path matter so much despite the fact that all around the island there is only endless water? What are the writers, Michaël Dudok de Wit and Pascale Ferran, telling us about our protagonist? The material does not hold our hands. Some are likely to dismiss the animation. It doesn’t look particularly realistic, heightened, or computerized in any way. The style of animation is unlike what animated movies offer these days. But that is exactly what I loved about it; the style, instead, matches the type of story being told, the mood, the energy, the feelings it invokes. It is like looking at a painting that just so happens to move. When you look at a painting—really look at a painting—it makes you feel or think about beyond what’s on the artwork. The animation here captures that idea perfectly. While watching the film, I was caught off-guard in that I began to think about my parents. Specifically, the sacrifices they’ve made for me so that I could be where I am today. Through the nameless character, I wondered about my mother and father’s goals—as a couple and as individuals—and how they’ve decided, both wittingly and unwittingly, to set aside such goals to make room for someone else in their life as a unit. The picture offers such beautiful statements about how life just is. The messages are there should one is willing to take the time to feel and think about it. It is most appropriate that the material employs a deliberately unhurried pacing, to make room for daydream. “La tortue rouge” embraces silence and meditation. Instead of words, we hear the sound of the waves, the cawing of the birds, the dancing of the trees. It made me want to go outside to touch plants, pick up rocks and discover what’s underneath them, breathe the air deeply, appreciate what’s around me. I wish more movies were like this.